Below are a number of maps we have collected in various sessions. They are included here to highlight some of the themes we have regularly encountered. There is, of course, no standard way to create a map so don’t worry if the maps you receive from users look different than these. Firstly, for clarity, the following are digital copies of the maps David draws in the video. 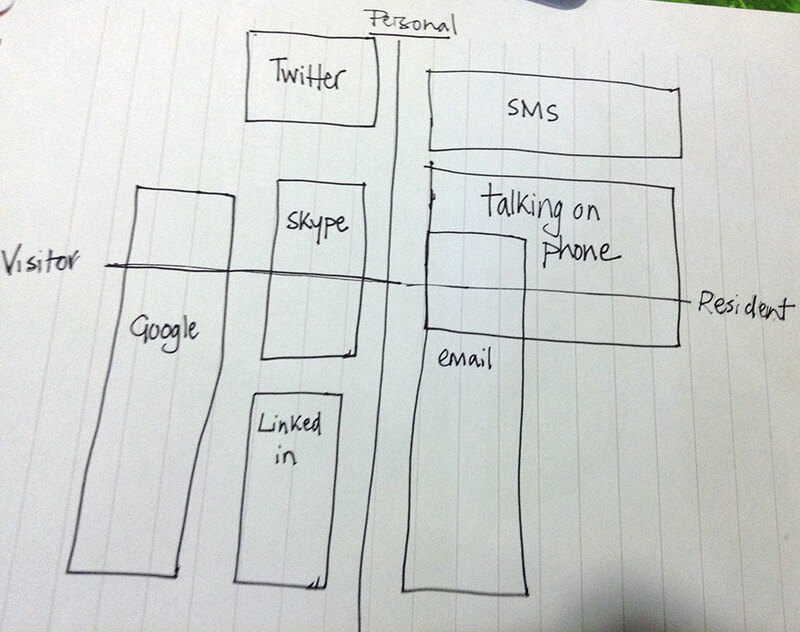 Note that David uses Facebook only as a kind of address book; therefore, it is in the visitor end of the continuum. 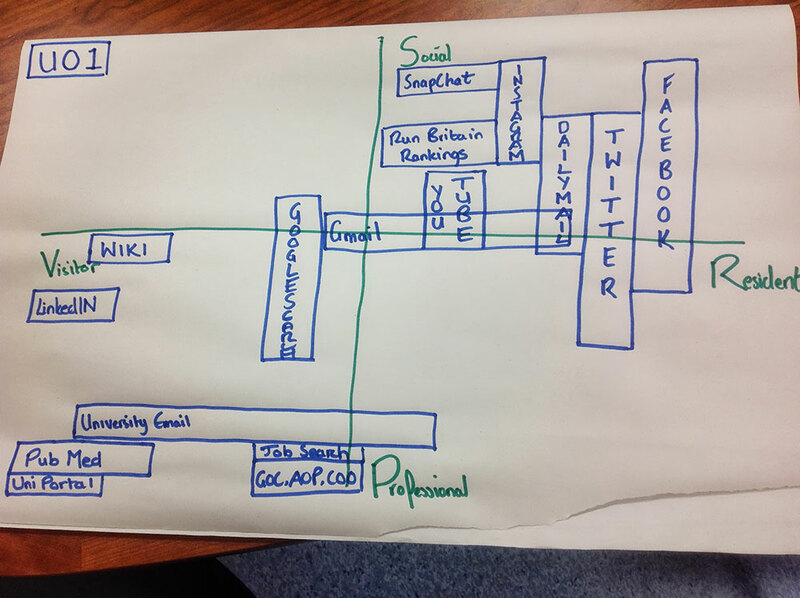 This is a map created by a senior manager at a session delivered at EDUCAUSE 2012. The highlights indicate how this individual has used two services with equivalent functionality with different modes of engagement. This is a good example of why it’s not possible to predict the mode of use from the apparent functionality of the tool ie some tools are appropriated very differently by different users. 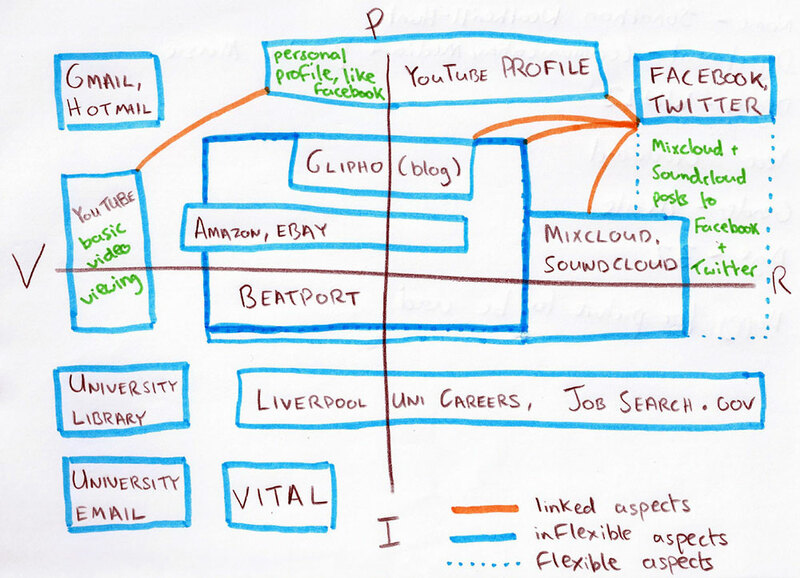 This is a map from a UK-based mapping session, created by a university educational consultant. You can see that this individual is most resident in well established technologies rather than social media. We would argue that this is not highly resident in the sense that it’s not openly visible in the manner of a blog comment or a Facebook wall post. It is, however, where this individual is most ‘present’ within technology. This map was created at the American Library Association (ALA) 2013 annual conference by a library professional. This individual is resident in the library catalogue, presumably spending significant amounts of time guiding users in their searches. They also have chosen to map the physical library in the centre of the map which would indicate that it is integral to all aspects of his/her life. 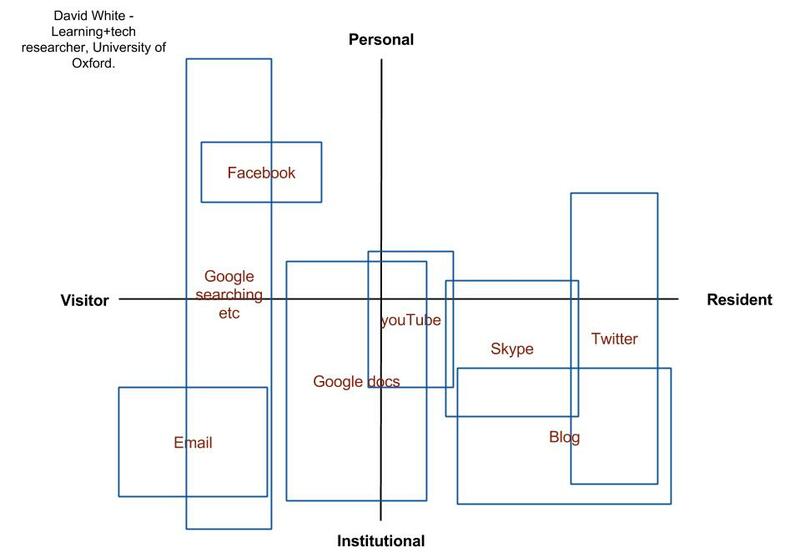 This is not a typical mapping position for the physical library as most individuals position it at the bottom left. 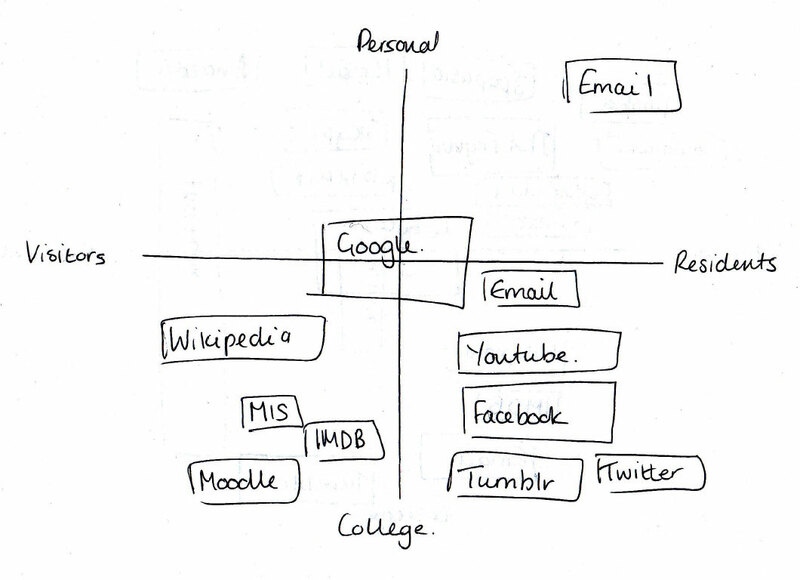 Blogging also is central to this map. 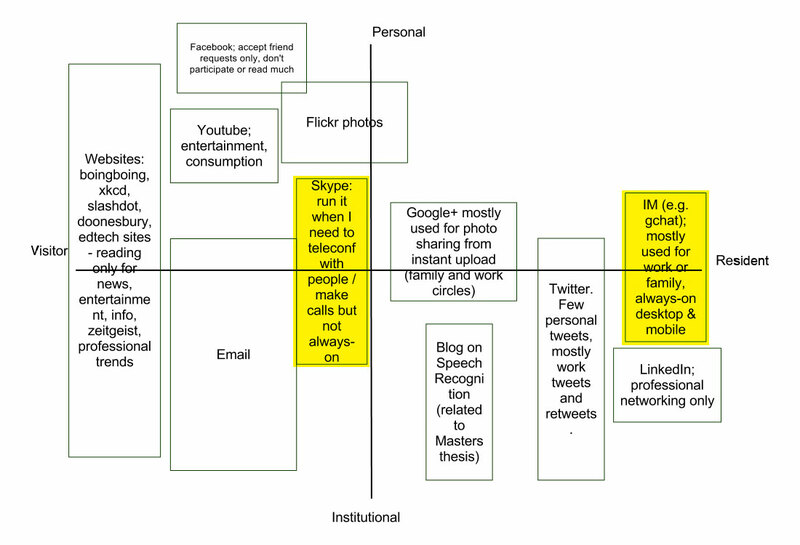 This mapping, with the positioning of the physical library and the central position of blogging, indicates that this individual’s personal and professional lives are intertwined. This map was created as part of the Higher Education Academy’s 'challenges of residency' project by a communication and media student in the UK. Things to note here are the position of the physical library and the two instances of YouTube, one when logged in and one when simply browsing. This map was created as part of the Higher Education Academy’s challenges of residency project by a master’s level biomedical science student. This map has relatively little in the top left and bottom right quadrants, which is fairly common, and might be an effect of the individual’s academic level and discipline. We also see a more sophisticated mapping of the information services made available to the individual by the university/library.